Having the Result Set of a Stored Proc Sent to You by RSS Feed. I wanted to monitor one of my system from my desk top and from my phone. I found a simple solution whereby I can subscribe to the result set of a stored proc by using RSS. So I can have this feed MS Outlook, my phone or my web browser. 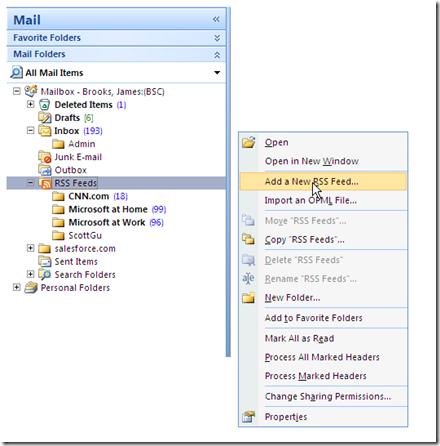 First, Visual Studio 2010 makes creating an RSS feed a simple matter that is about 1 page of code. Next the code behind simply calls the stored proc placing the results into a table and then loading up some of the RSS related collections VS2010 gives you. // I don't want just anyone to subscribe, so you have to know the GUID. // this gets the data from the database and populates a table. // RSS feeds can only have one author. // The stored proc returns different categories of data that I am interested in. To have this feed my Outlook RSS folder I just need to right click “RSS Feeds” and select “Add a New RSS Feed…”. 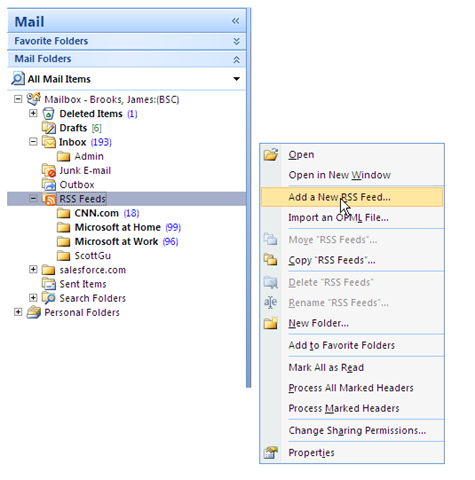 You should now have a folder in Outlook that will get populated by the feed. Logging Exceptions and the Commands that Caused Them. So the first part of logging the Exception is two methods on my base class. // don't want to get in an infinite loop. // Get the userId of the user that got the error. // Add the command that gave the error. //insert the exception and get the new ID. So now I have a complete logging of exception in my applications and it is a simple matter to make a page where I can view them, or make an RSS feed where they are sent to me. On one of our projects we have a requirement that we have to change our passwords every 90 day. So I created a page where I can just click a button and it will generate a password, change the password on the database for the user in the connection string and then change the password in the web.config. The page just has a button that say “Change Password” and a label called lblMessage to show the results. // 1. Open the web.config. // 2. Change the connString to have the new password. // 3. Change the password on the database. // 4. Commit the web.config change. // last possible second change it on the database. // error saving web.config change, so change it back on the database. // "data source=.\SQLEXPRESS;Initial Catalog=MyDb;User Id=McUser;Password=c99c0472e;"
// and a partName like "User Id" or "Password". // it returns the value for that partName. // Call the database to change the password. I needed to display some parent data with it’s child data on the same row like shown in the image above. I happen to be combining a few tables together into a new table (called dtPlan) and then binding the GridView to that new table. So this was my approach while moving the data into the dtPlan table. 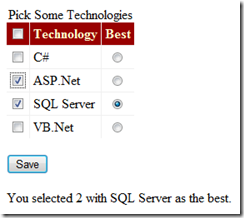 dtRampRates is the child table to the data in dtResults. The child grid is made in the “for” loop. Normally you would have this loop in the RowDataBound event for the GridView. With that approach it is easy to see how most of the code would be the same. I have a regular menu for my site and I wanted to use the Ajax Tabs Control as a submenu when the user was doing point-of-sale (ordering cards that describe the wine). So when the user was on POS on the main menu (black background) they would see the submenu as shown below. To make this, the first thing I did was create a new web user control and add the Ajax Tabs Control. 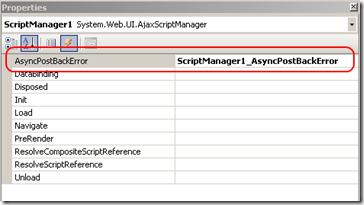 This user control is called wcPOSMenu and will be place on each of the 3 ASP.Net pages involved. You can see there isn’t much to the markup below. <%@ Control Language="C#" AutoEventWireup="true" CodeBehind="wcPOSMenu.ascx.cs"
<asp:TabContainer ID="TabContainerPOS" runat="server" AutoPostBack="true" BorderWidth="0px"
to Sort by That Column. 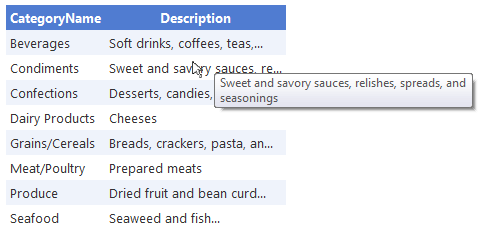 Enter a SKU to Add or Edit. One thing to note is that I couldn’t quickly figure out how to eliminate the tab’s containers border so I just made it a height of 12px and used that area as a subtitle to the rest of the content. Below is the code behind, there isn’t much to this either. 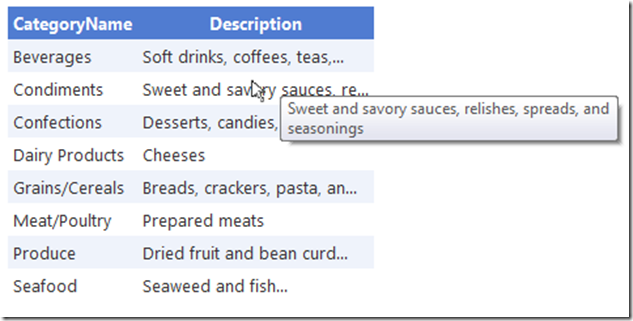 First you have a user control’s property TabIndex that can be set on each of the parent pages. So for my example the page for “Edit SKUs” will have this user control on it and it’s TabIndex property will be set to the value of 1. The page Page_Load event just uses that property to set the current tab. The TabContainerPOS_ActiveTabChanged just redirects the user to the correct page whenever they change the tab. To the user is appears they are selecting a menu option, but to the tab control they are actually changing the active tab. On each of the parent pages I just need to add 2 lines. The first is to register the user control, line 5 below. The second is line 9 below. Note the TabIndex property of the user control being set in line 9. 1: <%@ Page Title="" Language="C#" MasterPageFile="~/Site1.Master" AutoEventWireup="true"
Not many developers realize that you can change a plain HTML object’s attributes in the code behind without having to convert it into an ASP.Net control. So to bind this to the GridView we bind the first two columns only. The first GridView column is bound to the CategoryName data column and the second one is bound to the LineDescription data column with the heading title of “Description”. 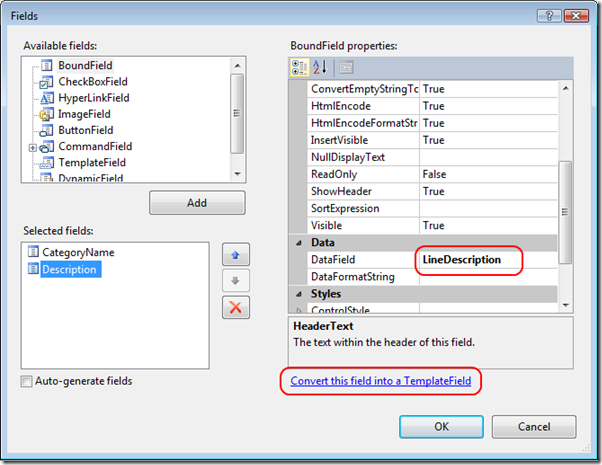 On the second GridView column we also click the “Convert this field into a TemplateField” as shown below. We save this and then edit the templates for the GridView columns. 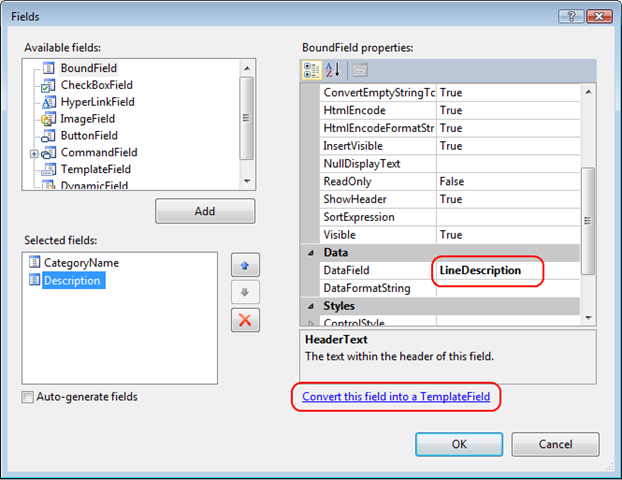 For the Description column we edit the ItemTemplate and we bind the ToolTip to the FullDescription data column. So now we have a short description in our grid, but the user can easily see the full description in the ToolTip. If you work with AJAX for any length of time you will find that no matter what the exception thrown in the code behind the message displayed to the user is “Exception has been thrown by the target of an invocation.” Not very useful. My approach to debugging the exception had been to comment out the UpdatePanel, recreate the exception and see the real error. But this doesn’t work at all when the code is deployed to the end-user. 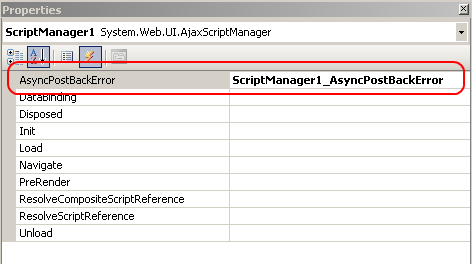 Then in the code for this event (code behind) we can change the AsyncPostBackErrorMessage to the actual error message in the exception. Note that I also log the exception which includes the stack trace so I can later research the problem. And in my endRequest function I set the label and turns off the alert box. // This will stop the alert box from displaying. // go to the top so they can see the error message. Note that the lblMessage label control needs to be inside the UpdatePanel so that it is cleared on the next PostBack. So now when I get an exception it displays the real error to the user in a label with red text, something like below. And the details are logged in my exceptions table. Much better than the default. I have a page where the user can select which users are active (using CheckBoxes), and also select one (only one) to be the administrator. I put together this sample to show how I did it. The sample uses technologies instead of user. The picture below gives you an idea. I didn't want to use the GridView "selected row" functionality because I didn't want to do a PostBack and I have another project where the user has to select 1 row per day where a day can take up 3 to 10 rows and there were many days in the grid. // See if this matches our saved selection. // Set the value to the RowIndex so it is unique. //Count of the number that our checked. //Normally you would be saving to the database here. <%@ Page Language="C#" AutoEventWireup="true" CodeBehind="SelectOne.aspx.cs"